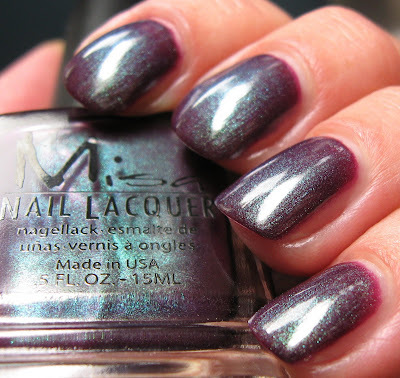 Misa's Embroidered Emerald is one of my favorite older shades from them--duo chrome, a flash of blue/green against a plum background--what's not to love?!! The shimmer in this one seems to float to the top of the base color, which is a plum tone that looks more purple or more red/brown, depending on the lighting. I'm not sure when this color came out or if it was part of a particular collection, but I picked mine up on eBay for about $10.00. I now notice that it is on Misa's web site here, so I put one in a cart to see if it would work and it didn't say out of stock. I'm not sure if it's actually available, but if you've been hoping to get a hold of this shade, that may work for you. oh yes - this is lovely! 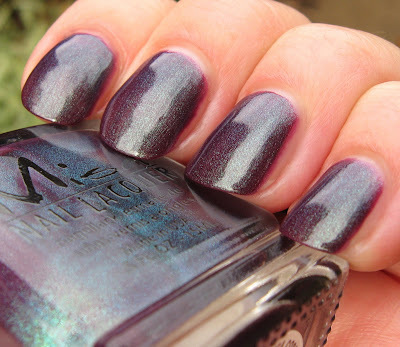 Various people have said this is a dupe for ORLY Galaxy Girl and UD Bruise. Can you comment on the formulas of any of these? I am not a patient girl so needing lots of coats and dry time is a dealbreaker for me. I had NO IDEA this even existed. It. is. wicked. good! I have to see if I can add this to my stash. 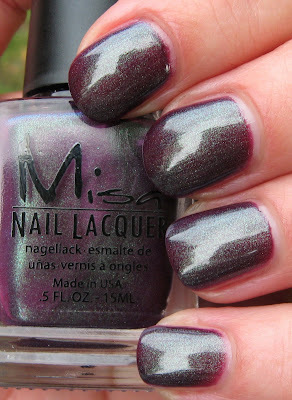 awesome i picked mine up at h2t its availible there i love, love, love this misa color! Wow, this REALLY reminds me of ORLY Galaxy Girl! But then a bit prettier. Leah, this is a perfect dupe to UD Bruise. I've owned them both and they're totally alike. But Bruise's formula is better. Bruise requires 2 coats (and has no toluene). This one was runny, more sheer, needed 3 coats and has toluene. I have this and it is one of my top 5 polishes. It is - and I rarely use this word - awesome. I love this one, I might try to order it on the Misa website. Gorgeous!! And lighter than Orly galaxy girl and Urban Decay bruise. Love it! Could you compare to GG? I loved your idea of showing the color differences on the cotton ball you used to remove the polish! It's so smart! Oeh this is lovely indeed! Like this shade. I'm going to add this to my "want" list. Love a duochrome. This one's a cool color! I like it a lot surprisingly! Pretty! It reminds me a tiny bit of Galaxy Girl.